For the first time in the history of tube amplifier design, the original "Edison Effect", or the essence of pure Thermionic Vacuum Tube Emissions has been fully utilized to yield very low Total Harmonic Distortion and produce "all-tube" type musical response characteristics in a home theater amplifier. With painstaking efforts and great attention to detail, veteran Pro Music Industry designer BK Butler has skillfully balanced the sonic response, load and transfer characteristics of individually selected twin triode vacuum tubes to operate under optimum conditions. Previous designs generally employed vacuum tubes in impedance-isolated preamp or pre-driver stages. 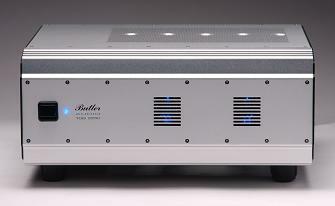 BK Butler's Tube Driver BLUE technology places the triodes exactly where they should be: DC coupled through the output power devices to the speakers. 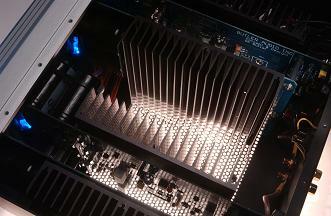 Therefore, the tubes are positioned to naturally and actively respond to the dynamic speaker load. This also completely eliminates one of the most inefficient and non-musical components in a typical tube power amplifier: the Output Transformer. 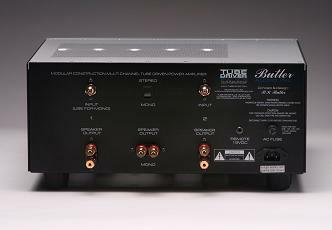 Without the phase shift and induction generation caused by hundreds of turns of wire and massive core iron to overcome, BK Butler's newly patented current multiplying DC coupled circuitry allows the 6SL7GT output driver tubes to directly operate into the constant ratio-reduced speaker load. This novel design allows the tubes to safely produce authentic power vacuum tube dynamic characteristics hundreds of times greater than their original design capabilities. Comparable in concept to precision racecar active power steering, BK Butler allows the tubes to "power steer" the audio output signal directly into your speakers. The result: A superlative marriage of tube and solid-state technology without the limitations of either. Literally, you get the reliable, efficient power capability of solid-state with all the greatly extended dynamics, warmth and musicality of the highest quality vacuum tube design available today.